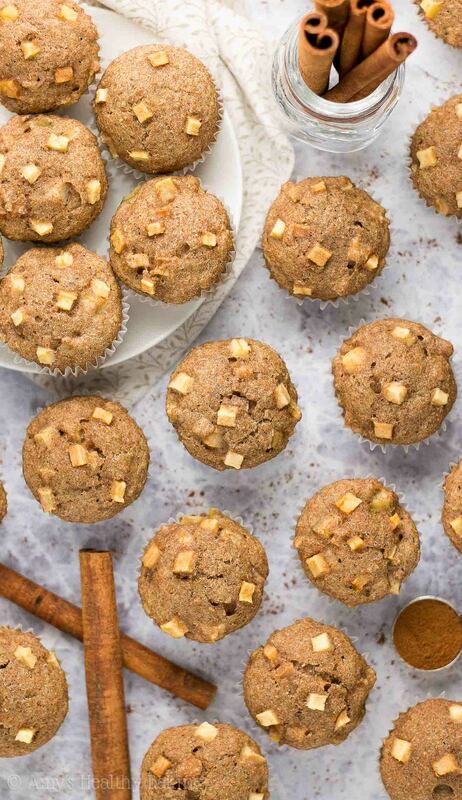 Tender mini muffins full of cozy spices & fresh apple bits. They basically taste like apple pie! Only 32 calories & no refined flour or sugar in this easy recipe! Over the holidays, one of my best friends flew to Southern California to visit her extended family. With a few free afternoons, she wrote to see if I was available to hang out, and I immediately said yes. Although she lived in San Diego for four years while attending college, my friend rarely left the neighborhoods around campus, so after I gave her a tour of my new house, I offered to take her to one of my family’s favorite fish restaurants near the ocean. Her eyes lit up, and they widened even further once we reached the place and she scanned the menu. She loved every bite of her seafood tacos and onion rings! With some spare time after lunch and before her bus left for Los Angeles, she suggested coffee. We found a local shop with a hipster vibe in Little Italy downtown, and we both ordered the same thing: a pour-over made with Guatemalan beans. While waiting for the barista to grind the beans and make our cups, we wandered around the store, exploring their various bags of coffee, t-shirts and hoodies, and owl-printed coffee mugs (their shop’s logo!). As we browsed, my friend noticed a small display case with sweet and savory treats tucked around the side of the register. Croissants, quiches, baguettes, tarts, macarons, éclairs… They all looked tempting from far away, but when I stepped closer, I noticed many of them looked a little peaked—and therefore not worth the hefty price tag, especially when I knew I had a batch of these Healthy Cinnamon Apple Mini Muffins in my fridge! 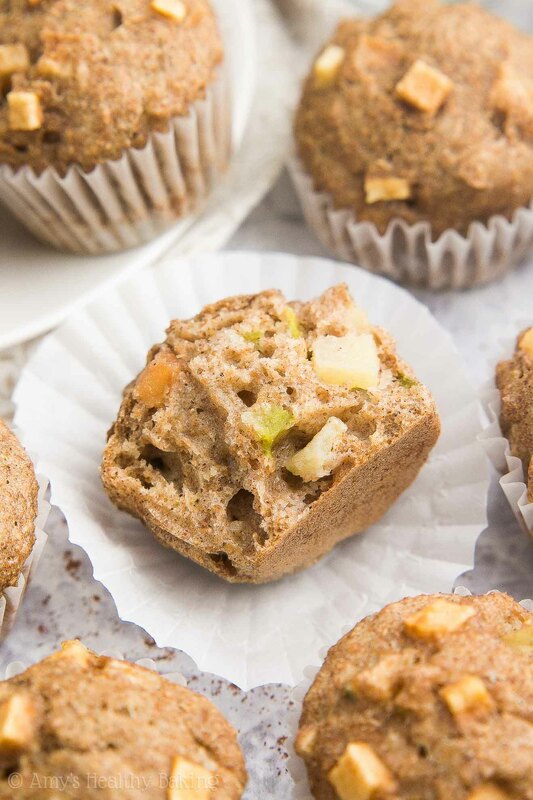 With their cozy spice flavor and sweet nibbles of fruit, these little muffins are perfect for breakfast or as a little snack alongside a mid-afternoon cup of coffee or tea. Since they contain no refined flour or sugar and just 32 calories, you could easily a second (or third, like me!) with absolutely no guilt! Besides… Any breakfast that basically tastes like apple pie is a true winner in my book. Perhaps you’ve noticed that trend? ? 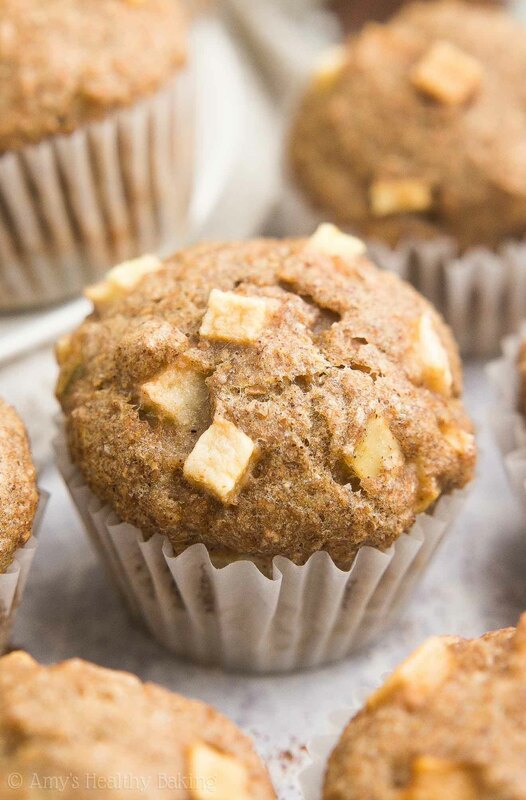 To make these healthy apple muffins, you’ll start with whole wheat flour (or gluten-free, if you prefer!) and a cozy blend of spices: cinnamon (← I’m completely obsessed with that kind! ), nutmeg, and allspice. I know the recipe title just says “cinnamon,” but the nutmeg and allspice create an incredible richness and depth to the flavor. Totally worth the extra effort of pulling them out of your spice cabinet—I promise! To cut down on calories, you’ll only use a mere ½ tablespoon of butter or coconut oil and 2 egg whites. 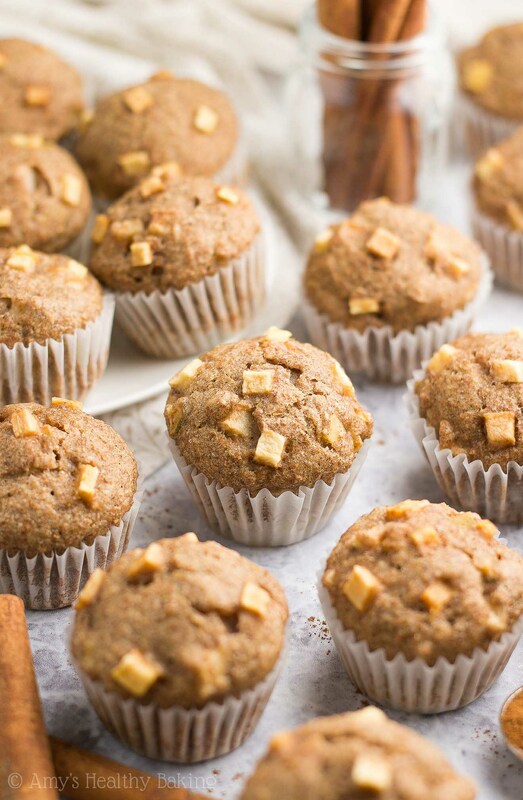 Even so, these healthy muffins are as tender as cupcakes! And that’s all thanks to Greek yogurt. If you’ve been around my blog for a while, you probably knew I was going to say that! Greek yogurt adds the same moisture to your batter as extra butter or oil but for a fraction of the calories—and it gives them a big protein boost, too! Now for the star of the show… The apple! I use Fuji apples because they’re naturally sweet and have a great texture for baking. However, it’s extremely important to cut the apples to be no larger than mini chocolate chips! This is because (a) larger chunks cause your muffins to bake unevenly and (b) larger chunks also don’t fully bake and stay pretty crunchy and raw. 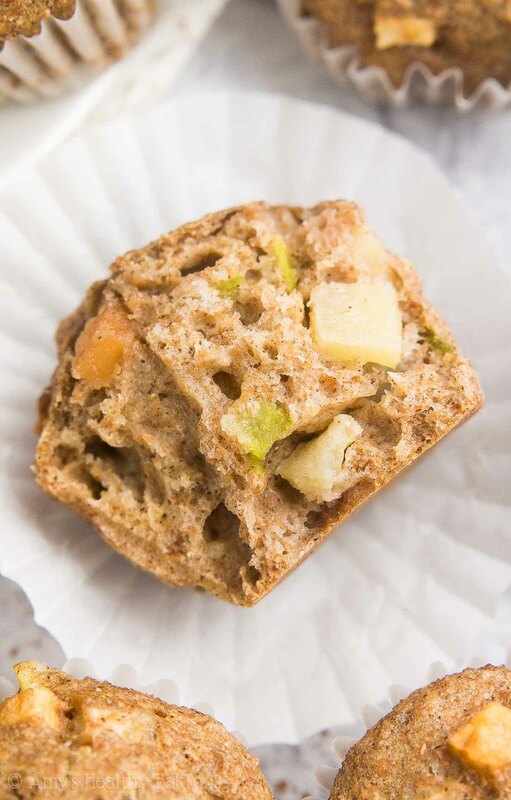 Your mini muffins only require about 10 minutes in the oven, which is enough time to cook itty bitty apple pieces—but definitely not larger ones! One last tip! If using muffin liners, remember to coat your muffin liners with nonstick cooking spray! Low-fat batters like this one will stick to liners like superglue… But this handy trick ensures the liners easily peel away from your muffins! How yummy do those look? Especially knowing they basically taste like apple pie?… ?? And when you make your own, remember to snap a picture and share it on Instagram using #amyshealthybaking and tagging @amyshealthybaking IN the photo itself! (That guarantees I’ll see your picture! ?) I’d love to see your mini muffins! 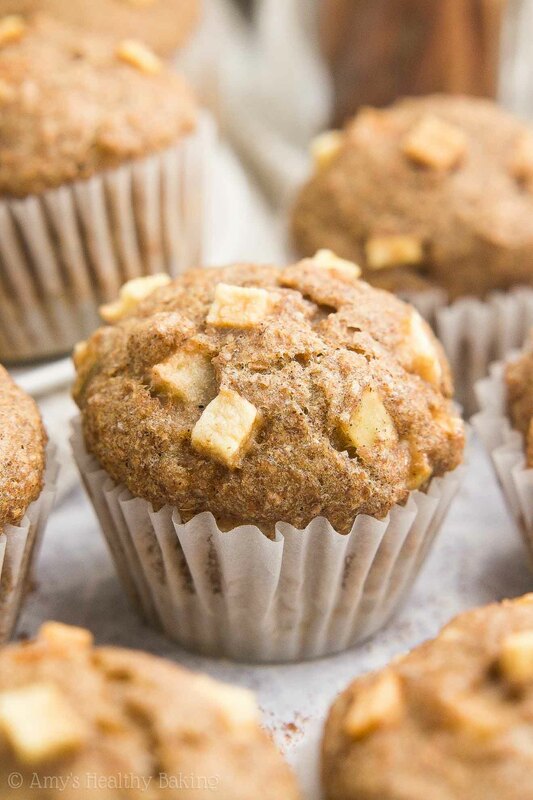 Apples were my favorite fruit as a kid, so I absolutely love these mini muffins. They basically taste like apple pie! They’re full of cozy spices and fresh apple bits, all held together with supremely tender muffin batter. Leftovers will keep for at least one week if stored in an airtight container in the refrigerator. In a medium bowl, whisk together the flour, baking powder, baking soda, cinnamon, allspice, nutmeg, and salt. In a separate bowl, whisk together the butter, egg whites, vanilla extract, and vanilla stevia. Add in the Greek yogurt, stirring until no large lumps remain. Stir in ¼ cup + 2 tablespoons of milk. Alternate between adding the flour mixture and remaining milk, beginning and ending with the flour mixture, and stirring just until incorporated. (For best results, add the flour mixture in 3 equal parts.) Fold in the apple. Spread the batter into the prepared muffin cups. Bake at 350°F for 12-14 minutes or until the tops feel firm to the touch and a toothpick inserted into the center comes out clean. Cool in the pan for 5 minutes before transferring to a wire rack to cool completely. Whole wheat pastry flour, white whole wheat flour, or all-purpose flour may be substituted for the regular whole wheat flour. I highly recommend using the vanilla stevia! It’s one of my favorite ingredients, and you’ll use it in all of these recipes of mine, too. I buy mine online here because that’s the cheapest price I’ve found. If you prefer not to use the vanilla stevia, then substitute ½ cup (120mL) of pure maple syrup, honey or agave. If using this substitution, reduce the milk to 6 tablespoons (90mL). I use Fuji apples because they’re naturally sweet and have a great texture for baking. It’s extremely important to cut the apples to be no larger than mini chocolate chips! This is because (a) larger chunks cause your muffins to bake unevenly and (b) larger chunks also don’t fully bake and stay pretty crunchy and raw. This recipe will also make 12 standard-sized muffins, if you prefer. Bake at 350°F for 20-23 minutes or until the tops feel firm and a toothpick inserted into the center comes out clean. 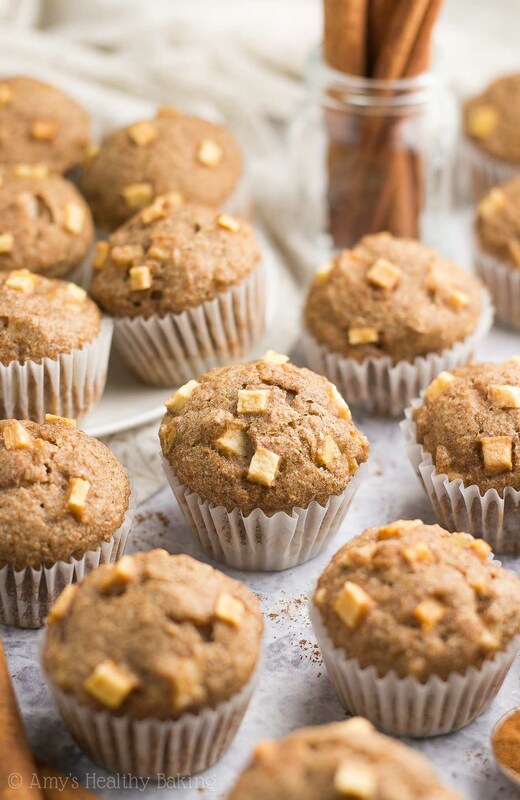 ♡ …and the rest of Amy’s healthy muffin recipes! What is the nutritional value if you make 12 Healthy Cinnamon Apple Muffins instead of the mini- muffins? I really appreciate your interest in my recipe Joyce! This is the free nutrition information calculator that I use, if you’d like to know that data. 🙂 I can’t wait to hear what you think of these muffins! Thanks so much. These just sound absolutely wonderful and I can’t wait to try them. I guess 3 small would equal about 1 large muffin. Looking forward to trying this recipe asap and having a muffin with yogurt and coffee for breakfast. Can I use the egg replacer – EnerG – for the egg whites? If so how many “eggs”? Yes, definitely! You’ll need 1 tablespoon of Energy + ¼ cup of warm water for the 2 egg whites. 🙂 I can’t wait to hear what you think of these mini muffins Aileen! Yes, that’s right — 3 mini muffins should be the same as 1 standard-sized! 🙂 I can’t wait to hear what you think of them, Joyce! These look so yummy but I don’t habe liquid stevia. Would stevia packets work instead? Thanks for the information Suzy! You’ll need 15 of Wholesome Organic’s stevia packets to replace the vanilla stevia. The baking time may be slightly different, but it shouldn’t vary by more than 2-3 minutes. I can’t wait to hear what you think of these mini muffins! What can i use instead of vanilla stevia? and if there is a replacer how much? I really appreciate your interest in my recipe Sandy! I’ve actually covered that already in the Notes section underneath the instructions. It can be easy to miss! 🙂 I can’t wait to hear what you think of these muffins! I really appreciate your interest in my recipe, Andrea! I’ve actually covered that already in the text directly beneath the recipe title in the recipe box. It can be easy to miss! 😉 I can’t wait to hear what you think of these muffins! I actually just finished making this recipe, and I’m so disappointed . It just never raised and the taste is way off, the apples are sweet and I substituted the stevia for the honey in the quantity you mentioned, but it tastes like metal. I really appreciate your interest in my recipe Cindy! That sounds disappointing, so I’d love to help you solve those issues. 🙂 How fresh are your baking powder and baking soda? Did you use teaspoons, not tablespoons, for each of those? How was the texture of the muffins?